WSGA: Thank you for all who participated in the Ape Event this year. There are a few trackables that still need to be logged out, please do so. 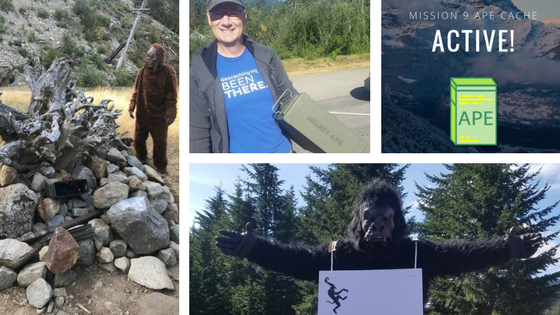 The Pacific Northwest is THE destination for geocachers on the third weekend of August - International Geocaching Weekend - and WSGA hopes you will join us for our 9th annual Going APE Mega Event. The APE is found in the rugged, snow-capped Cascade Mountains, just a short drive from Seattle, where you can walk through the spooky 2-mile-long Tunnel of Light, find one of the oldest caches in Washington, and visit the the last remaining APE cache in North America. Plus, we hear that Sasquatch and Fen Dweller have been sighted in the area - so watch out! If you're new to geocaching, you may be wondering: What the heck is an APE cache? Check it out: Mission 9: Tunnel of Light. Origionally placed in conjunction with the release of the Planet of the Ape movie, 14 caches were placed with a unique icon. Alas, our beloved APE cache was stolen and archived in 2011. Due to the concerted efforts of a small band of cachers the origional container was found about 300 feet down the hill and abandoned in the bushes, with some of the origional swag still inside. With Groundspeak's blessing and the imput of the community, the last Ape cache in North America will be unarchived and reinstated in its place of honor in time for our event and allow you to once again find the unique icon. Time & place: 10:00 am - 2:00 pm on Sunday, August 19, at the Hyak trailhead in Iron Horse State Park at Snoqualmie Pass (posted coordinates). We'll be in the field at the far end of the parking lot. The park and tunnel are open dawn till dusk, so you can hang out all day if you like. Event map. We're a low-key mega: no formal activities, no group photo, and no vendors. This is all about a fun day in the beautiful Cascade Mountains with good friends, a spooky tunnel, and some awesome geocaching. Hyak parking requires a Discover Pass (day or annual); our parking attendants will sell you a $10 day pass if you don't have one, or you can buy one at the on-site kiosk. The nearby Forest Service lot requires a Northwest Forest Pass (day or annual); we will have passes for sale at this lot and our parking attendants will sell you a $5 day pass if you don't have one. Hiking: The hike from Hyak to the APE cache is 3 miles (6 miles round trip, including two trips through the tunnel). The Iron Horse Trail is a broad, flat, packed-gravel trail with little elevation change. It's an easy hike. Bookmark list of caches. Biking: Bicycles are allowed on the Iron Horse Trail and in the tunnel, so feel free to bring yours. (We don't recommend road tires due to the rockiness of some sections.) If you bike, be sure you have a headlamp and watch for hikers, especially in the tunnel. Unfortunately, there are no bike rental places near Hyak, so that's not an option. Time required: Please plan a half day for this event (or longer, depending on your caching plans). It takes 30-45 minutes each way to drive Seattle to Hyak, and round-trip distance to the APE cache is 6 miles. Refreshments: If you hike/bike, you should bring sips and snacks. There are picnic tables at both ends of the tunnel, so you can relax and enjoy the scenery while you have lunch. What to wear: You're hiking 6 miles, so dress accordingly, including footwear. Be sure to check the Weather for Snoqualmie Pass - it could be a cool day or a scorcher, sunny or rainy. The tunnel is quite chilly (50°F), so you may want long sleeves or a jacket. Your clothes might get dirty, as the ceiling drips muddy water in places (hats are recommended), and the trail may be wet. What to bring: You'll need a flashlight or headlamp for the tunnel, plus a day pack with hiking essentials for your party. Depending on your plans, this may include food, water, camera, hat, bug spray, suntan lotion, first aid, camera, emergency whistle, sunglasses, extra batteries, trekking poles, maps, ibuprofen, camera... Also bring your Discover/NWF parking permit or cash to buy one. First aid: We will have first aid available at the first aid tent, so please go there if you need help. The event monitors at each end of the Snoqualmie Tunnel will also have first-aid kits. Dogs: Dogs are allowed at Hyak and on the trail, but keep them on a short leash at all times for the courtesy and safety of others. This is especially important in Snoqualmie Tunnel, where visibility is limited; we don't want any bicycle/dog collisions. Motorized transport: No motorized vehicles are allowed on the Iron Horse Trail, which means no motorcycles, ATVs, golf carts, etc. Motorized scooters or wheelchairs are permitted for users with mobility impairments; park policy requires you to notify the event director and provide your name. Please send us a message through the Message Center with any questions. This event is sponsored by Washington State Geocaching Association. If you are a geocacher in the state of Washington, please consider joining WSGA. See the WSGA website for details.